The EFW Flat Roof System makes it possible to install windows on flat or very low-pitched roofs. 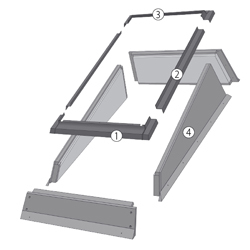 The system elevates the installation angle of the window by 15° in relation to the roof pitch. The system is mainly used in order to provide some more natural light into production halls and warehouses while at the same time maintaining good thermo-insulating properties. The system is also used when adapting the attic with low pitch roof to living space. It is normally used to install single windows in the roof. Windows can also be installed in horizontal combinations with a minimum distance of 30cm between them. The EFW sysem can be manufactured to order e.g. for three windows installed side by side. The system is intended to be used with flat roof coverings. Besides the mentioned, there are also available EFS designed to be used with smoke ventilation windows and EFE systems fit for FW side hung escape windows. The system is intended to be used with flat roof coverings with roof pitches between 0° and 15°. The EFW system is made up of two basic elements: a wooden housing with insulation material bonded to it, and flashingto join the window to the housing. Brackets for installing the window are included. After installing the wooden housing, it should be properly sealed and fixed to the existing roof covering.